For most writers, crafting short stories takes a lot of effort and sometimes, even brute force. When the words won’t put themselves together in a coherent form, many times writers have to bludgeon them into place and then see what shakes out. I speak from personal experience on this, as several of my shorts are the result of relentless pounding and under-the-breath cursing. I’m not sure if any of the writers involved with the WICKED WITCHES anthology went through this ordeal, but if so, the results are well-worth the angst. 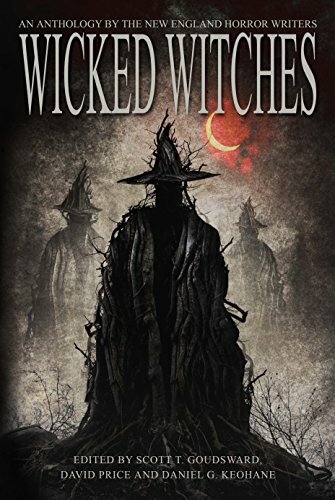 WICKED WITCHES is a great collection of short stories about exactly what the title describes: those evil sorceresses that thrive on wreaking havoc through their mischievous magics. These twenty-two tales are a delight to read, and horror fiction fans will want to add this anthology to their libraries as soon as possible. Given the geographic proximity of where these New England writers are based, I cannot think of a more qualified group to write about witches and their dark intentions. I’m not sure how many of them (if any) live close to the original Salem Township, but I would imagine being anywhere within 1,000 miles of the place would be inspirational enough to crank out endless accounts about witches and witchcraft. The stories in WICKED WITCHES are all written well, and each does a great job of offering up a unique tale. In fact, this abundant originality is a big part of what makes this anthology so good. The authors appear to have worked hard to stay away from traditional tropes about witches, and thankfully so; the overused and overdone concepts of witchcraft are getting as frequent as zombie stories. One of my favorite stories in this collection is “Run in the Widow’s Hell” by K. H. Vaughan. In this tale, a moonshiner during the Prohibition era makes a bad decision to drive through a patch of woods where a witch lives. As I’m sure you can guess, things don’t end well for him. I love the atmosphere the author creates, as well as the way the story concludes. WICKED WITCHES is a big win for me, and I highly recommend this book. I’m very happy this talented group of writers was able to make witches scary for me again. As such, I cannot wait to see what they do next. WICKED WITCHES is available now in a variety of formats.